When you think Yobuko, you think squid. It’s so famous for squid, that people queue to get into restaurants here. Even the boats look like squids! Yobuko Big Bridge (呼子大橋) – a very large bridge connecting the mainland to a smaller island it has proved to be a popular attraction for many people since it open in the late 1980s. Yobuko Port- the port services access to Kakara, Ogawa, Madara Islands (Madara being the biggest island in the Prefecture with a unique historic Catholic history) and many other small islands. You can catch a number of ferries to explore the outer islands. 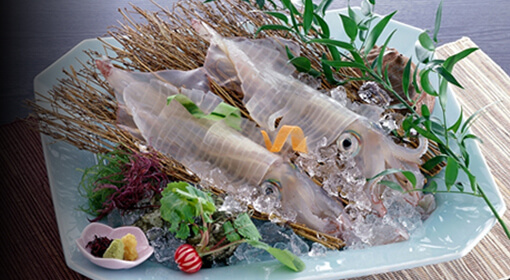 Eat squid – Yobuko is famed for its fresh squid (ika), which is offered sashimi style, or it can be eaten while the squid is still alive. 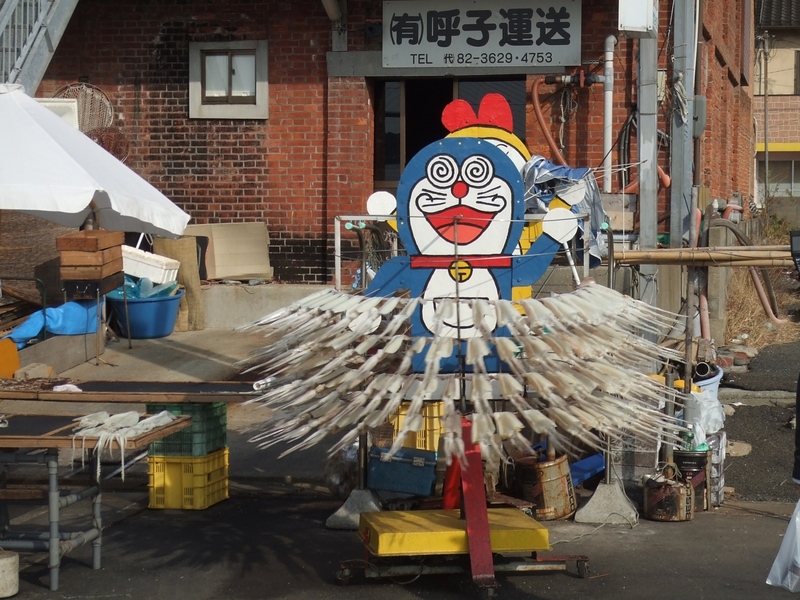 Yobuko Morning Market – if you get to the town early enough you can check out the Yobuko morning market. It’s open every morning from 7:30 and sells fresh seafood and vegetables on a shopping street called Asaichi-dori (Morning Market Street). Marine sightseeing – sightseeing service that takes you out around on a glass bottomed boat around Karatsu’s coastline and caves (including the famous Nanatsugama). 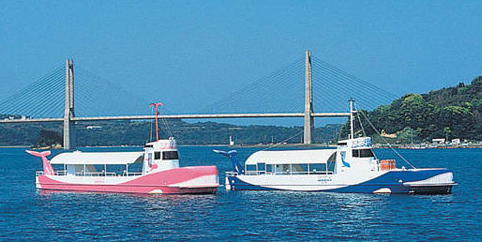 You can usually choose between the pink or blue whale ship or the giant squid shaped boats. Festivals – Yobuko’s most famous festival is Yobuko Ouzunabi (呼子大綱引), or the Yobuko Big Rope Pull, which takes place annually on the first Saturday and Sunday of June. The event involves a big tug-o-war between two factions in the town, and local legend says that if the hills (farmers) faction wins, there will be a good harvest that year; and if the sea faction (fishermen) wins, there will be a good fishing harvest that year. Between events you can visit the rope museum on the same street as the Morning Market.